Induction lamps are essentially fluorescent lamps without electrodes. Unlike the fluorescent lamp, which uses electrical connections through the lamp to create light, induction lamps use energy transferred through the lamp envelope via electromagnetic fields or induction to create this same light affect. Electromagnetic transformers–rings with metal coils–create an electromagnetic field around a glass tube containing argon gas, using a high frequency generated by an electronic ballast. The discharge path, induced by the coils, forms a closed loop causing acceleration of free electrons, which when excited emit ultraviolet light. The UV light is converted to visible light as it passes through a phosphor coating on the surface of the tube. The unusual shape of an induction lamp maximizes the efficiency of the fields that are generated. Why White Light? It’s Just Better. There’s a reason why so many cities, commercial builders and commercial developers are switching to energy-efficient, white light. It’s simply better – better for the eye, better for people, better for the planet and better for the bottom line. This white light has proven to be one of the most cost-effective, long-lasting, low-maintenance lighting choices commercially available. Most importantly, it saves more than money. Vivid, clear, white light allows us to see more easily, makes streets safer by reducing the frequency and severity of traffic accidents, deters crime by lighting entryways and potentially hidden locations, and makes people feel more secure . Energy efficient white light’s superior efficiency is best seen in low light. Compared to yellow light, white light is brighter, with a high Color Rendering Index (CRI) and Correlated Color Temperature (CCT), yet it consumes less energy, resulting in lower energy costs. Multiple studies conducted by lighting scientists at the Lighting Research Center (LRC) in Troy, New York, have shown that the eye perceives white light as brighter, more pleasant, and more natural than yellow light. LRC’s studies also revealed that people associate white light with a more enjoyable overall experience than yellow light. Colors are truer, faces and objects are easier to distinguish – making people feel safer and more secure. White light has also been shown to increase peripheral vision by two times FN, and to decrease breaking times by more than 25 percent. This has meant fewer accidents and safer streets for drivers and pedestrians. A viable energy efficient white light source is induction lighting. HID light is emitted from a plasma discharge rather than a filament. Types of HID lamps include mercury vapor, metal halide, high-pressure sodium and low-pressure sodium lighting. Like fluorescent light, the HID system uses a ballast to start the light and specific gases to produce the light. Metal electrodes conduct energy to a light-emitting gas. Its use of dissimilar materials and vapor make HID lighting vulnerable to failure. As the lamp heats, the metal and glass expand at differing rates. The stress of prolonged cycles causes separation of the components. Failure can also result from escaping gases, ambient temperature, and vibration. HID lighting’s efficiency and color rendering varies depending on the gases used, from the bluish-white cast of metal halide lamps to the yellow light of low-pressure sodium. Lighting quality is central to creating a more inviting, effective ambience. A good example of how light quality affects our perception is the high-pressure sodium lamp. Among the HID lighting types, high-pressure sodium lamps have often been the first choice in outdoor commercial lighting. This is primarily because they have a relatively long, reliable lifespan. However, the distinctive, unnatural yellow light produced by high-pressure sodium lamps has a very poor Color Rendering Index (CRI) of approximately 22. This means that correctly distinguishing color under this type of light is difficult. For years, HID lighting was certainly the dominant choice for many commercial applications, as it once offered a reasonably long life and relatively high efficiency. However, in recent years, HID lighting has been overtaken by more energy-conscious and cost-effective lighting choices, like induction and LED lighting, for an ever-expanding range of commercial applications. HID lighting remains more complicated to manufacture, consumes a significant amount of energy, and has a high rate of depreciation and color shift. The relatively poor construction and limited lifespan of HID result in on-going costs due to lamp and ballast purchases, as well as man-hour allocations for bulb-replacement and general maintenance. Outdoor Lighting Perspectives offers complimentary design services from our professional lighting designers. See the lights on your home at night without making a payment. LEDs differ from incandescent and fluorescent lighting in the way that they produce light. In an incandescent lamp, a filament is heated by electric current until it glows or emits light. In a fluorescent lamp, an electrical current excites free electrons, which emit ultraviolet (UV) light. The UV light is converted after striking the phosphor coating on the inside of glass tubes, and is emitted as light. The LED, in contrast, is a semiconductor diode. It consists of a chip of semiconducting material treated to create a structure called a p-n (positive-negative) junction. When connected to a power source, current flows from the p-side or anode to the n-side, or cathode, but not in the reverse direction. When an electron meets a hole, it drops into a lower energy level, and releases energy in the form of a photon of light. The greater the “drop” due to the semi-conductor “gap”, the greater the energy and the photon frequency emitted. Because of the way they are constructed, LEDs produce a point source light. LEDs have several advantages over conventional incandescent and HID lamps. 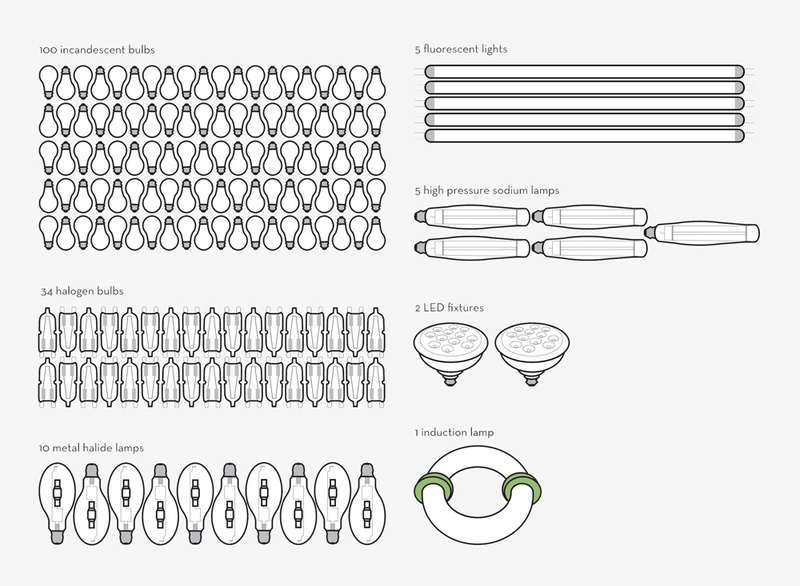 Like induction lamps, they don’t have a filament to burn out, so they are long lasting. Additionally, their small plastic bulb makes them much more durable. But one of LED’s biggest advantages is its efficiency. Over the past few years, LEDs have become more efficacious. As predicted by the US Department of Energy, white LEDs utilizing phosphor conversion continues to improve its efficacy. As with traditional lighting, the light-production process involves generating a lot of heat (the filament must be warmed). This is wasted energy, as much of the available energy isn’t going toward producing visible light. LEDs convert a much higher percentage of the electrical power to generating light, which considerably reduces energy demands. Because they produce highly directional light, LEDs have potentially higher application efficacy compared to other light sources in certain lighting applications. Fluorescent and standard “bulb” shaped incandescent lamps emit light in all directions. Much of the light produced by the lamp can be lost within the fixture, reabsorbed by the lamp, or escapes from the fixture in a direction that is not useful for the intended application. LEDs emit light in a specific direction, delivering more light to its designated target. RGB (Red, Green, Blue) and RGBA (Red, Green, Blue, Amber) systems allow for precise control over the color of the light emitted. This system is even capable of producing a white light that is tunable to various color temperatures of white light. RGBA systems are able to more accurately produce certain colors, such as yellow and amber, when compared with RGB systems. The primary cause of lumen depreciation in an LED is the heat generated at the LED junction, the point where the light is generated. LEDs do not emit heat as infrared radiation (IR) like other light sources, so the heat must be removed from the device by conduction or convection. If the LED system design has inadequate heat sinking or other means of removing the heat, the device temperature will rise, resulting in lower light output. Modern high-power LED devices use silicone as an encapsulant, to minimize this problem. The temperature environment in which the fixture will be operated. For a given LED system, higher ambient temperatures will result in a shorter operating life; lower temperatures will allow the LED to operate even longer than anticipated. System design has a significant effect on LED operating life. In fact, two fixtures may show radically different operating lives in the same ambient, due to how well they are designed and how efficiently they remove heat from the LED. Both ambient operating temperature and fixture design have an impact on the junction temperature. While fixture design is the primary determinant of junction temperature, the ambient temperature can have a significant impact on the life expectancy of the LED. Across the United States, the average nighttime temperature is about 48º F. This temperature is 60º F lower than the ambient temperature at which LEDs lifetimes are estimated. It is reasonable to expect that a given fixture used outdoors, exclusively at night, would have a realized lifetime much longer than that of the same fixture used in an indoor lighting application, where the ambient is typically 77º F or higher. in which the LED chip emits blue or near ultraviolet light. The LED chip is coated with phosphor, which interacts with the emitted light to produce white light. This is similar to the way in which light is generated by a fluorescent lamp. RGB (Red, Green, Blue) systems mix the light output from three or four monochromatic LEDs (amber can also be used to increase the color palette) producing white light that is “tunable” to many different colors of light, including white light of various color temperatures. Color quality has been one of the key challenges facing white LEDs. Photon frequency determines visible light and color, as does semiconductor and lens coating materials. Variations in wavelength and flux, as well as variation in phosphor can mean color shift over time, temperature and drive current. While HPS technologies continue to improve incrementally, LED technology is improving very rapidly in terms of luminous efficacy, color quality, optical design, thermal management, and cost. Combined with its inherent advantages, recent advancements in LED technology have opened up to an increasingly broad range of applications. LEDs are an effective and dynamic choice for commercial applications such as area and site lighting, roadway and street fixtures, architectural and landscape lighting and life safety or emergency systems. For commercial outdoor lighting applications, LED is an option against high pressure sodium (HPS) lighting. Recent advances in LED technology have resulted in outdoor systems that can provide the required surface illumination using less energy and with improved uniformity, compared to High Intensity Discharge (HID) sources. LED fixtures have also been shown to have significantly longer life (50,000, compared to 10,000 to 25,000 hours) with better lumen maintenance.